The Fire Weather Research Laboratory is located in the Department of Meteorology and Climate Science's Arnold True Atmospheric Observatory on the top floor of the Duncan Hall of Science at San José State University. The lab is the most well equipped fire weather research laboratory in the United States. For more information on the CSU-MAPS see the recent article published in the Bulletin of the American Meteorological Society. The lab consists of an instrument repair and testing facility including full electronics bench with tools, power supplies, multimeters, scopes, and soldering equipment. The wind tunnel has a 1m x 1m test section and is equipped with a Campbell Scientific CR10000 data logger. 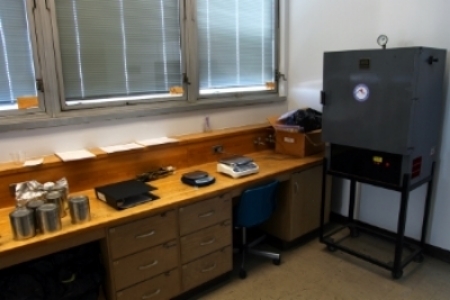 The lab bench is used for instrument repairs and instrument preparation for field deployments. Additional lab equipment includes a thermocouple welder for building fire-wire thermocouples, tools, multimeters, and power supplies. The lab conducts monthly and bi-month fuel sampling for wildfire danger assessment for the San Francisco Bay Area. Our fuel sampling site is located at Blackberry Hill near Los Gatos, California. Data are regularly uploaded to the National Fuel Moisture Database where it is available to the public. The fuels station is equipped with a drying oven, multiple scales, and sampling containers and field tools. Click here for fuel moisture data. The lab space includes a conference table for group meetings, research discussion, and teaching. The lab has office space for post-doctoral researchers and desks for 5 graduate students. SJSU's Doppler Sodar deployed for measuring vertical wind profiles in a mountain valley. The lab is equipped with an extensive array of instrumentation to carry our elaborate field measurement campaigns including micrometeorological towers, upper-air soundings, and remote sensing of the boundary layer.